When Apple released their iPhone they never forgot to mention that the iPhone was able to play YouTube videos. I think they mentioned it as a key feature and several television ads showed this feature as well. 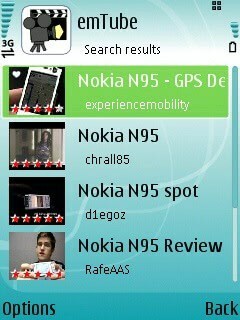 If you do not own an Apple iPhone but another mobile phone, maybe like the Nokia N73 (my phone) or Nokia N95, you will be delighted to hear that a Symbian S60 application emTube brings YouTube to those phones as well. It gets even better. The Nokia N95 has a special version of that application that uses the phones accelerometer to rotate the video on screen if you rotate the phone to change between portrait and landscape mode. The emTube applications makes it possible to play YouTube movies either from the local flash memory of the phone or by downloading / streaming videos to your phone instead. Videos can be browsed on YouTube and several comfort settings, like configuring the number of search results or if you want to start the video manually or automatically, make emTube a wonderful application that looks really promising. Update: emTube appears to be no longer available. The website states that the service will eventually be back, but there is no word on when that is going to happen, or for how long the notice has been posted on the homepage of the service. I'm unfortunately not aware of any alternative to the service. What you can do however is convert videos you have on your PC into a format that the Symbian phone can play. While that is not as comfortable as watching the videos directly, it may at least give you an opportunity to watch videos at all on the phone. Note that we are not responsible for the application, and cannot guarantee its functionality. Since Symbian is as good as dead, it likely does not make a big difference anyway. There is an errata in your article, since iPhone does not even have flash (any version), let alone supporting streaming flash videos. Being an adobe employee i can tell you, this feature comes with flashLite3, the mobile equivalent of Flash 8.0 which was released in november 07. What iPhone does support is streaming 3gp (very old technology) from a toned down version of youtube which contains just about a 1000 videos that google converted from flv to 3gp cause Apple begged them too. Why are mi do not stop. Is my flash media.